People no longer use the phone book or newspaper to find a local business, they look online. Whether on their smartphone, tablet or computer, people are searching for your business. The question is, are they finding you or your competition? Our Jacksonville Local SEO team can help you reach the top in local business directories such as Google+ Local, Bing Local, Yahoo Local and more. The goal of Local Search Engine Optimization, or Local SEO, is to promote your business to those most likely to be your customers, people in your local market. If you own a dry cleaners in Ponte Vedra Beach, it doesn’t help you if someone in San Diego finds your website. Local directories like Google+ Local are a critical component in successful online marketing for small and mid-sized businesses. Not only are your customers searching Google for information about the types of services you provide, they are also seeing your online reputation in the form of online reviews. Analyze your business. We will ask you questions that will help me get a better feel for your business including what steps you might have already taken to improve your local reach. Keyword research. With your own feedback of what keywords you hope to rank for, we will research and find the keywords that you have the best opportunity to rank for. Google+ Local listing audit. 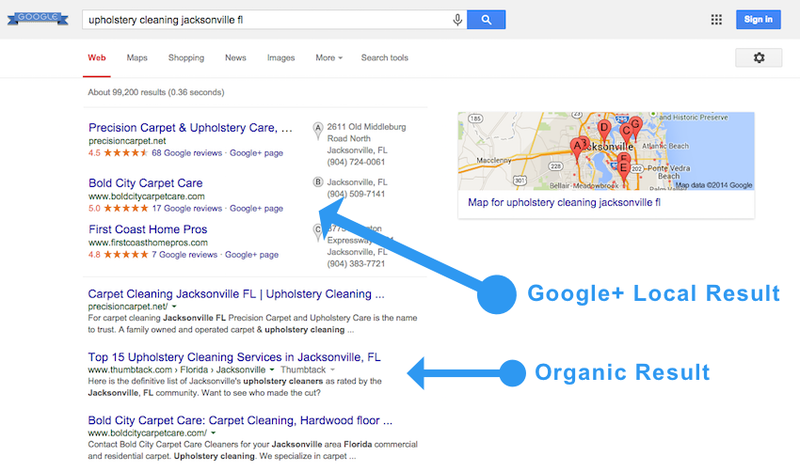 We will create, claim, and/or fix issues with your Google+ Local listing so that it’s perfectly optimized. Local directory citation audit. Apart from Google, there are other local directories to pay attention to. We will claim and/or correct citations from all of the important sites. Consistency is key. Website. We will tune-up your website, whether we developed it or not, to make sure you have all of the right tweaks done on the back end and front end to aid in local SEO efforts. We have 10 years of experience not only building websites, but also in search engine optimization, especially with local businesses. We will not over-promise. We’d rather be straight with you about realistic expectations since every business is different and results will vary. It’s about finding and taking advantage of the opportunities available to your business – whatever it may be. Contact NJS Marketing today to learn more about local seo for your business. NJS Marketing is proud to provide local search engine optimization (seo) to the following communities in Northeast Florida: Jacksonville, Jacksonville Beach, Atlantic Beach, Neptune Beach, Ponte Vedra Beach, Fernandina Beach – Amelia Island, Orange Park and St. Augustine. We practice 100% white hat methods and follow all of Google’s webmaster guidelines. Call 904-419-7848 for a free consultation or fill out our inquiry form and one of our Jacksonville Internet Marketing Experts will be in contact with you soon.